Dressed up a bit more floral-ish for the occasion! Trying on one of the floppy hats in-store while Wendy behind was going around selecting an outfit to showcase! Her mega fluffy purple pullover & skirt are both from Rosebullet! Qiuting taking a OOTD photo in the mirror & cute polka-dotted dress on the mannequin! The fluffy pullover comes as a set with a matching ribbon! Here's Wendy in the purple one, beside the pastel pink & blue versions! Both Wendy & I are big Harry Potter fans so it made sense to drop by the exhibition since it's at Marina Bay Sands as well! Poor Qiuting is not a fan (has not even watched all the movies) so FHL haha. By the time I blog this the exhibition will be over so information in here is redundant lol FYLs. Tickets for foreigners were $24 & $20 for Singaporeans! There's also a combination package if you catch both the Harry Potter & Andy Warhol exhibit. Wendy: "You know Andy Warhol? The Campbell soup one?" Me: "You got see those like very comic-book style one?" Haha none of us were dying to catch it so we stuck to Harry Potter! The staff also said it would take approximately an hour to finish the exhibition which was just nice! Anyway the exhibition is mostly about the Harry Potter MOVIES, not the book. It consisted of props from the movies, which were actually remarkably detailed! That was suspenseful music to help your imagination because no pictures were allowed hahaha. I quite enjoyed the exhibition! For $20 I think it was totally an ok price to pay. It was nice to relive all those memories because I haven't read my Harry Potter books in a while although I still remember even the most mundane details quite clearly! As per usual, I came out of the exhibit badly wishing I was a wizard, as I did when reading the books. Souvenirs purchased from the exhibition! 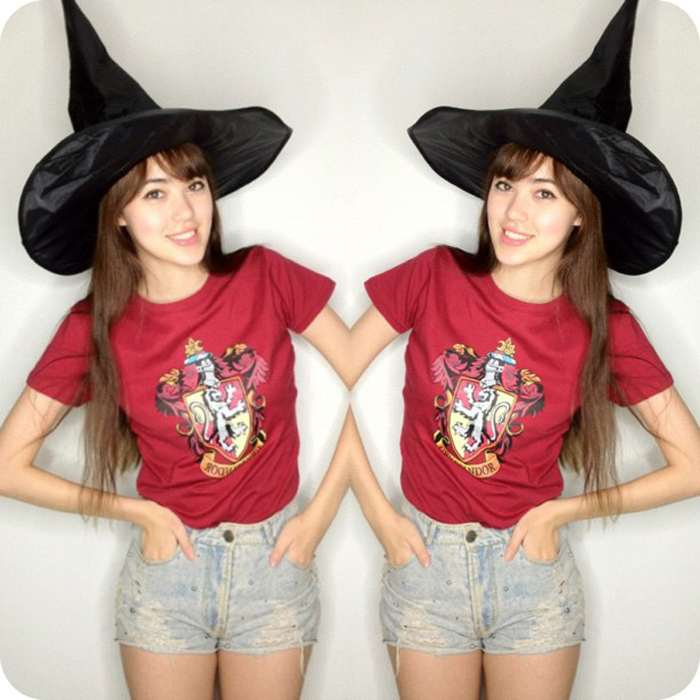 Chocolate frogs ($6) & Gryffindor t-shirt ($50)! Each chocolate frog comes with one card (like in the book) but I have two because Qiuting gave me hers; she just wanted to try the chocolate! Perks of a non-fan-friend haha. One mega plain notebook cost $18 while a single magnet was like... $12? Wand sets of 6 wands, albeit very nicely carved, were a few hundred dollars! I got McGonagall & Lockhart! Lockhart is such a meh card... but there were other completely obscure (both Wendy & I had never heard of them) personalities as the random collectible card so it could be worse! I would have preferred a normal collectible card! Haha I'm planning to wear it to school! Picture from my Instagram (@sophiewillocq)! And I actually wore this witch hat a few years ago to catch the movie premiere for one of the Harry Potter films! Both Addie & I did, but of course we took it off for the movie itself or the people behind us would probably not have agreed that our witch hats are highly ingenious. I TOOK A BUS TO TOWN THAT DAY. I WORE MY WITCH HAT ON THE BUS. 7 comments on "Rosebullet x Harry Potter"
Aw so cool! Wish there was a Harry Potter convention here in California. the fluffy pullover is so pretty! do you know how much it costs? thanks!